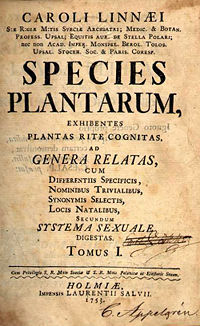 Today in 1753, Carl Linnaeus published the first edition of his two volume work Species Plantarum, in which he used for the first time a consistent naming structure for plants and laid the basis for modern nomenclature. The classification employed in the work allowed easy identification of plants, by placing every genus into an artificial class and order. Linnaeus is often called the father of classification. The Species Plantarum will be adopted by international consent in 1905 as the starting point for modern botanical nomenclature. This entry was posted in classification, information organization, Taxonomy, This day in information. Bookmark the permalink.